Update: This recumbent exercise bike is listed as ‘Currently Unavailable’. I’ll keep an eye on the listing (as usual!). 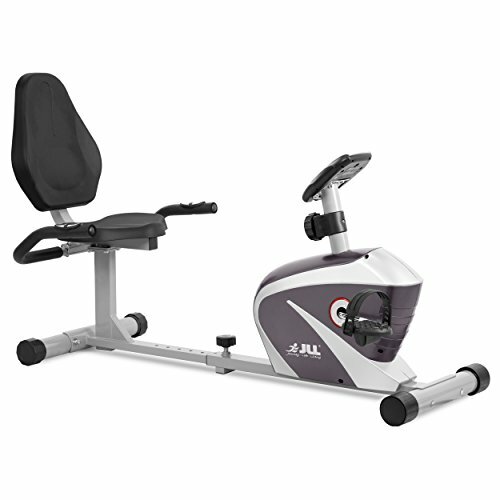 There is a very popular alternative, the JLL RE100 – a great looking recumbent exercise bike at a solid price. Check out the gallery and spec on this dedicated amazon.co.uk product page now! 8 Levels of Magnetic Resistance. Quiet Belt drive technology. Display: Time, Speed, Distance, Heart rate, Calories. Heart Rate Sensors built into handlebars. 6-level adjustable seat to fit your shape and size perfectly. Adjustable toe straps for the pedals. Summary: This is a unique mixture of two things – it folds (using an X-frame type setup) and also has a proper seat with a backrest (recumbent). The Ancheer Folding Recumbent home bike is in the budget price range, and could be a decent solution to those who prefer to burn those calories in comfort! Keep in mind that for this lower price, your bike will not be like those at the gym. It is sturdy (many comments from buyers repeat this), and is quiet enough to use in front of the TV. You’ll get a basic monitor, pulse meter and adjustable resistance. Check out the gallery (which does include an unlikely looking male model using one!) and the latest discount on the dedicated amazon.co.uk product page here. When you see this bike you’ll immediately notice the lack of handlebars. The reason that these are not needed is that you’ll be sitting back, rather than sitting perched up on a saddle. A large seat has a back rest, which keeps you comfortable while also keeping your legs free to do the peddling. There are several colour options, and is it the main unit with the pedal mechanism which is brightly coloured. With some of the colour options, you’ll get an adjustable arm where you can rest and iPad or tablet to keep you entertained while you pedal. You’ll be able to adjust the resistance through 5 levels, the lower levels are very easy, and will just get your legs moving. As you go towards number 5 you’ll notice that it is harder to pedal. This is a smaller unit, so you can’t expect the super-tough resistance that you’ll get with some spinning models and more expensive exercise bikes. A small amount of assembly is needed, some people indicated that this is 30 minutes approx. Overall the feedback is good. The small number of negatives seem to have had missing parts (amazon always refund in those situations if you return the goods). Hopefully the maker has cleared up those issues. Based on the Q&A one buyer was upset that there were 2 different maximum weights given at different times and was about to send his bike back… who knows whether he followed through on this threat! Sturdy was a word which keeps on coming up in the comments. A lot of people also noted that this is a decent product for the price paid. It was noted that the back rest is non-adjustable, though in general people using this recumbent bike found it to be comfortable. Most recumbent exercise bikes are bigger models, and in the mid-price+ budget range. Also, most of them do not fold away. I like the innovation here, with Ancheer breaking the usual ‘rules’ on how recumbent bikes should be made! You’ll get a sturdy and comfortable bike for a very keen price. With built in display and pulse rate monitor, you can track your progress while you cycle. Check out the gallery and read those buyer comments for yourself now on the dedicated amazon.co.uk product page here.